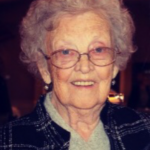 Elizabeth Louise Mei, 89 of Waterford entered eternal life on Tuesday, December 4, 2018 surrounded in the comfort of her loving family. 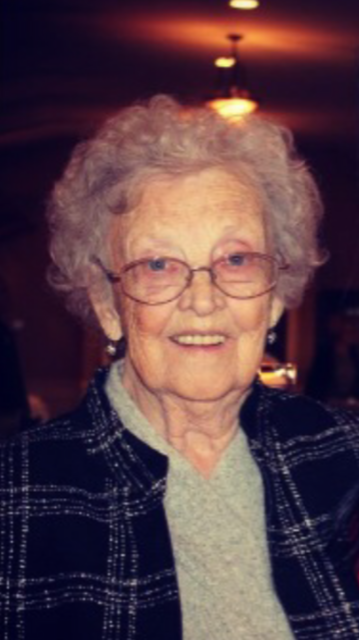 She was born on July 28, 1929 in Jewett City, CT to the late Vern Thornton Sr. and Olive Stafford Thornton. She attended local Griswold schools and graduated from Griswold High School. She was united in marriage to Ernest “Frog” Mei on June 16, 1956 at St. Mary’s Church in Jewett City CT. She was predeceased by Ernest on October 20, 1988. Elizabeth is survived by her daughters, Mary Anne Sexton (Scott) and Melissa Holmes (Paul). She is also survived by her loving granddaughters, Stephanie Dlubac (James), Courtney Sexton Caulfield (Mathew), Jennifer Roberson (Timothy) and Alexandria Holmes. Elizabeth’s greatest moments of her life were the births of her great grandchildren Camden James Dlubac and Claire Jane Dlubac. Sharing these last years with her great grandchildren were the best years of her life. Elizabeth will forever be remembered as “Big Nanny”. She was predeceased by her brother Wayne Thornton and her sister Patricia Drobiak. She is also survived by a brother Vern Thornton of Florida and a sister in law Mercedes Talmadge of Windsor CT and a host of loving nieces and nephews. Her family will receive relatives and friends on Friday, December 7, 2018 from 10:00 a.m. to 11:30 p.m. at the Impelliteri Malia Funeral Home, 84 Montauk Avenue, New London, CT followed by a mass of Christian Burial at 12 p.m. at St. Joseph’s Church. Interment to follow at St. Mary’s Cemetery in New London, CT.